Who is the insured driver? Who is responsible if it causes a accident? Who will charge it when the battery runs flat at 0200 in the morning? Who will redirect it through a temporary diversion? Who will change the tyre in the event of a puncture? Who will pay the fine if it jumps a light or speeds through a temporary or variable speed limit? You will not see me in one in a month of Sundays. Angry Andy wrote: Who is the insured driver? I gotta agree. Makes me far too nervous. I think it’s just a bad idea all around. I’d much rather have a flying car ala The Jetsons. Do you think you'll be the guy - to make the Queen of the Angels sigh? Not for me, its an accident waiting to happen. With computers and games for kids too, mobile phones, driverless cars, and now talking of robots etc, I wonder do the government's want to raise the now kids as robots themselves. Not thinking for themselves, doing as their told, etc. The future should be a worry to us all. Does it come in blue? 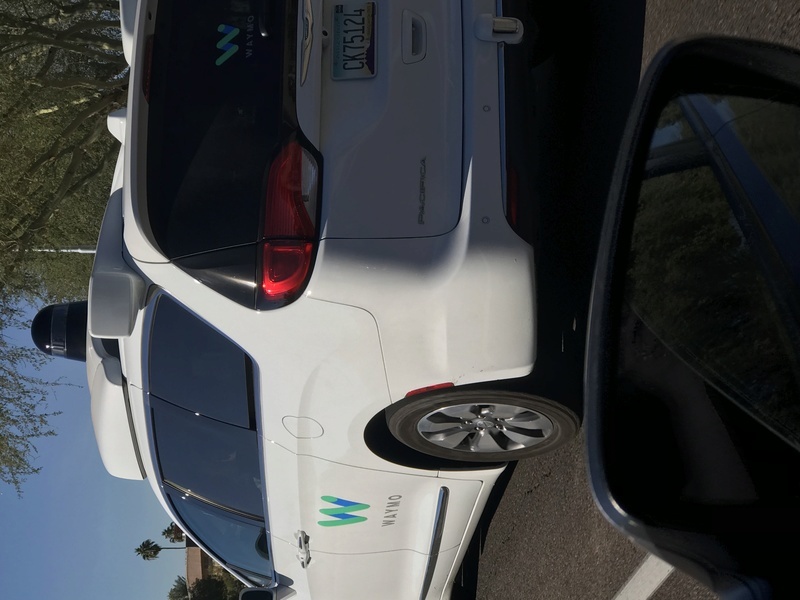 it depends on legislation that is not written yet in most places, in California this was raised with the google car and the court ruled google would be the insured driver so it would pay any fines or be liable for at fault accidents. the others would consumer maintenance, who fills your petrol tanks? We saw two today. They are being trialed up here in Chandler, Arizona where senior junior lives. They both had drivers but was interesting to see one. Had no idea it was happening here. Still wouldn’t get in one. Cost a fortune to buy and maintain,if you don't want to drive , take a Taxi ! Yup. Was an episode of Criminal Minds. Put me right off of the idea. Once technology is out there, it can be hacked. I’m sure that my son and his wife will try one out sooner rather than later. Don't like Driving?.............get a Taxi ! Much cheaper in the long run. nicko wrote: Cost a fortune to buy and maintain,if you don't want to drive , take a Taxi ! this goes back to my point about 'servicing' it would have to include a way to update the cars software and thus be able to patch any potential hack, which the company can find out first by offering a bounty to anyone that can hack it. Also it all becomes a bit more complex legally regarding liability if the software worked fine but some critical mechanical malfunction occurred due to poor maintenance is google still at fault? there isn't any test cases to say yet. Is there any one who thinks this is just a "Flash in the Pan" and when the excitement wears off it'll turn into a White Elephant? Will you be having one, if not why not? nicko wrote: Will you be having one, if not why not? If i still lived in the city i would consider getting one as soon as they were reliable and all the legal stuff was worked out. Out here I'd have to wait until they were really reliable (I commute 140km a day, 70 each way), and even the best ones can't avoid Roos yet.... to be fair even as a human driver you can't predict they way they'll bounce. I would keep a standard (i.e. non-autonomous..) ute, SUV wagon, and/or a small truck, for beekeeping and farm_work, offroad use and heading out away from towns and cities..
And consider renting one for use in around the cities (using it like a cheap taxi/personalised bus service..). Much cheaper and more practical, over the long run..
» Whose your Democratic candidate?